Dwarf evergreen of dense low spreading growth with small ovate dark greyish green leaves. 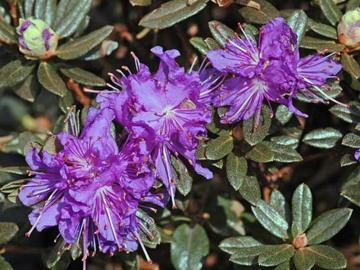 Clusters of deep violet-blue flowers in April or May. Free flowering even when young. Sun or part shade and moist, well drained acidic soil. Rock gardens, riased beds, good for patio containers.